My wonderful husband got me just want I wanted for my birthday last year--a belgian waffle maker! Preheat waffle iron according to its directions. My iron is ready when the light goes off. Whisk dry ingredients in a medium mixing. Make a well in the center and add eggs, butter, and vanilla. Mix together slowly adding in just enough milk to get consistency desired. Pour about 1/2 c of the mixture into the center of your waffle iron; spread around. Again, this may vary depending upon the size of your iron. Cook until golden brown, flipping after 2 minutes if your waffle maker flips. Mine took about 3 minutes per waffle. When done, the waffle will be beautiful and drop away from the iron. 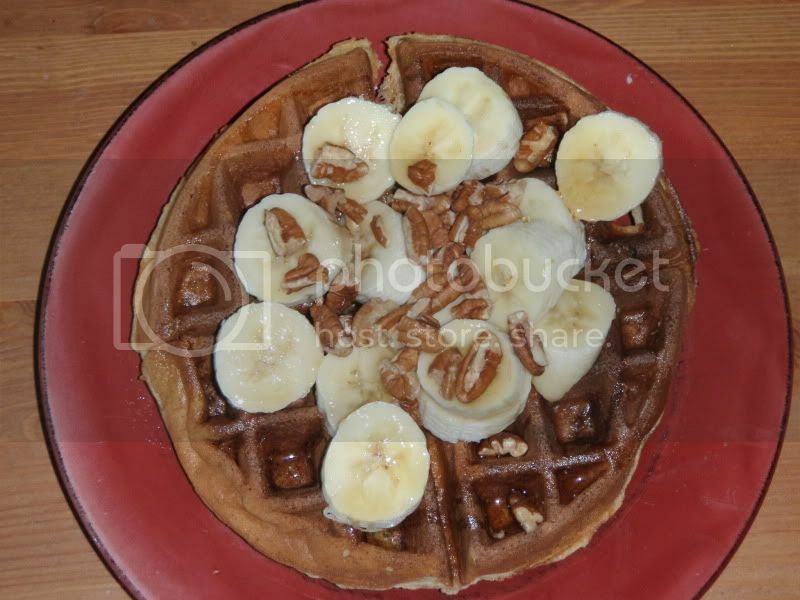 Serve with slice bananas, chopped pecans, and real maple syrup. Makes 4-6 depending upon the size of your iron.